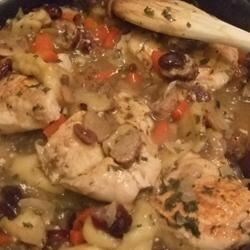 "This slow cooker recipe creates a wonderful, mild, sweet and spicy flavor and works best with frozen chicken. Serve over rice or couscous, or with crusty bread for dipping." If a thicker gravy is desired, turn the slow cooker to High during the last 30 minutes and stir in 2 teaspoons flour dissolved in 1/4 cup of water. This was a great recipe. I had never started with frozen chicken before and will do it always from now on. The chicken didn't get dry like it usually does. Thanks for sharing! This was great. I think the best thing to come out of my crock pot! We had it with risotto.